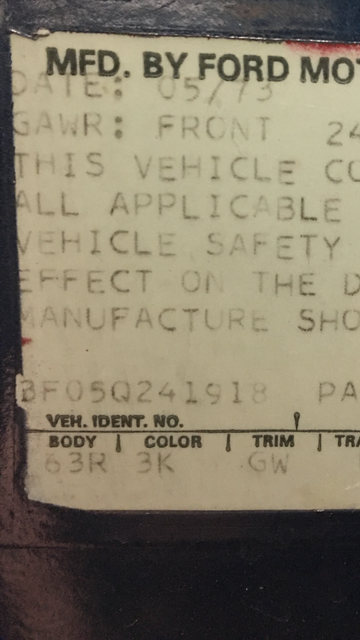 Anyone ever have to deal with a typo on the title of their car on the VIN? My VIN in 3F05Q241918, but on my title it says 3F0RQ241918. As far as I know there never was an "0R" body code, correct? Also does anyone else have a VIN that ends in 8? the plate on my dash pad has a goofy looking 8, it looks like the top of the 8 is flat. i've never needed to deal with that.. but it's obvious u gotta take it back to dmv and the vin verified by inspector then re-do the paper work. it should not cost u a penny for it was there mistake. Notice how the "R" is right below the "5" on your keyboard? A DMV employee fat-fingered that one. The 8 is what I'm used to seeing on the 71-73 VIN tags. (06-09-2018, 08:16 AM)Hemikiller Wrote: Notice how the "R" is right below the "5" on your keyboard? A DMV employee fat-fingered that one. The 8 is what I'm used to seeing on the 71-73 VIN tags. I had a typo on the title of a '69 Fairlane. They had reversed two numbers. I took the car into the local police department, who looked at the dash tag and the number stamped in the inner fender and signed off on the correct VIN. DMV then issued a corrected title. It probably happens a lot. My nephew had a 1966 mustang and the DOT showed up one day and wanted to see his car and check the VIN. He had the wrong title for his car and all owners before also. It was one number off. They corrected it. I sent in title for the 16,000 mile 1950 Ford I have and it came back as a 1951 I did not even bother to try to correct. We do have DOT inspectors now that will fix things like this. My title on the Boss reads 1FO2R instead of 1F02R. I have not had any issues since O and 0 are similar. (06-08-2018, 10:14 PM)Fredensborg Wrote: Anyone ever have to deal with a typo on the title of their car on the VIN? My VIN in 3F05Q241918, but on my title it says 3F0RQ241918. As far as I know there never was an "0R" body code, correct? Also does anyone else have a VIN that ends in 8? the plate on my dash pad has a goofy looking 8, it looks like the top of the 8 is flat. 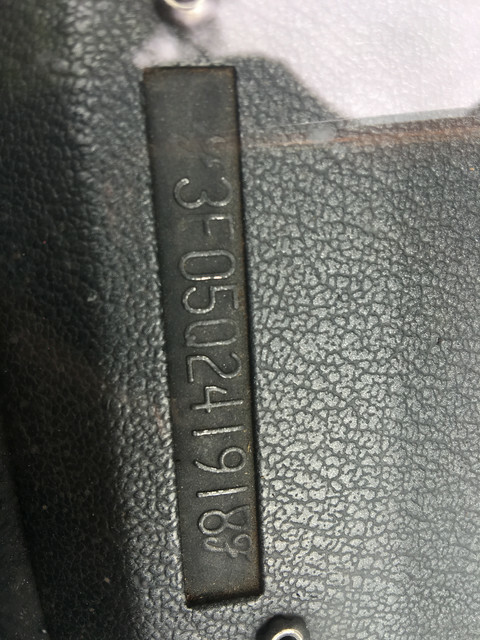 That goofy little symbol after the last digit in the VIN in the dash plate (8 in your case) is a Script "F". I assume the "F" is for Ford. This is all a DMV in your state the title is issued thing. It could be as easy as taking in ESPECIALLY if the title shows "previous title" record number . The state , SHOULD have all of the records leading up to the current paper. If you show them their mistake - they may correct it. WORSE case would be you have to pay $5 for the fee to cover mailing ! P.S. I guess the WORST CASE , would be if the mistake was made by a traceable employee and there get fired !